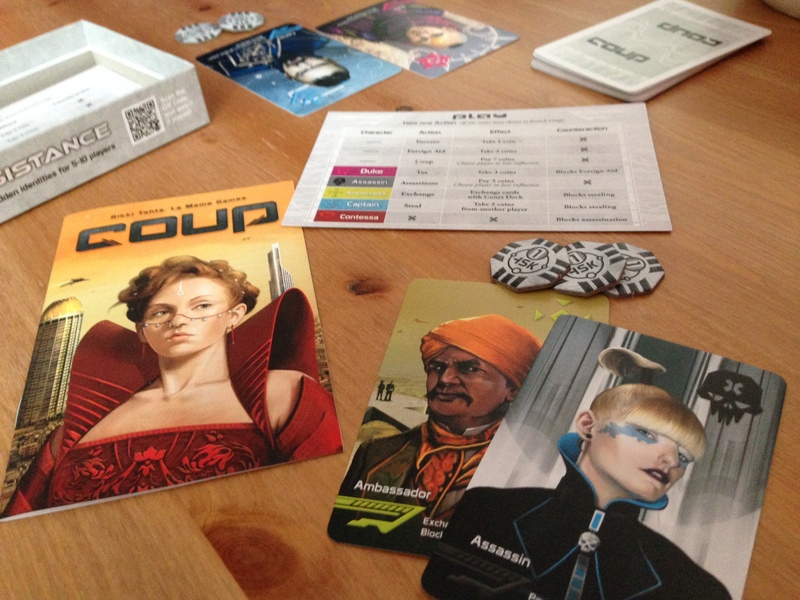 Review: Coup…How good is your poker face? ‘The Resistance’ is pretty much an institution in board gaming by now. Thats just a fact of life. If you turned over a rock in the desert, you would find a table of neurotic board gamers shrieking in a high register “I’m not a SPY! !” So when Indie Boards & Cards announced back in April on Kickstarter they were reskinning the original Coup with a Resistance theme, we came running like a crack addicted bullet train. Well the time has come, and its finally arrived. As the government starts to collapse around you, up to six players seek to take control by influencing key figures in a political poker game. Each person is dealt 2 cards, the Duke, Ambassador, Captain, Assassin or the Contessa. These cards represent officials that you have leverage with. You’ll take turns claiming you have favour with one of the aforementioned characters, using their powers to get money, kill your political opponents or gain more influence, all in the aid of funding your coup d’ etat. However, any of your opponents can contest your supporter, and if you are caught trying to take advantage of the situation without the favour of your claimed political figure, you lose influence. On the other hand though, if you DO have the support you claimed to have, your challenger looks like a fool and he/she loses their influence. Once you’ve lost both of your supporters, you are out of the game and need to take a seat on the losers couch with Sarah Palin. Ultimately though, just like a sword fight between immortals, there can be only one. The last back-stabbing politician standing wins. One of the cool side effects of ‘Coup’ is it fleshes out the narrative that ‘The Resistance’ started. In the latter you witnessed events from the perspective of freedom fighters in a corrupt dystopian future, whereas in ‘Coup’ you get to see how high rollers do business. The next time you finish 5 or 6 games of ‘The Resistance’ you won’t have that hollow feeling of a bad come down anymore. Now you get to see the other side the story. While the grunts are fighting the good fight destabilizing the status quo, others are ready to step in and seize control in these opportunistic times. Even if you’ve been living in a cave for the last 4 years and you’ve never heard of ‘The Resistance’, ‘Coup’ is a sublime game by itself. Its wickedly fast, super tense and just oh so exciting. When you’re holding on to your last card and the turn is going round, you’ll be frantically scheming trying to ready yourself for your next move. You’ve decided to bluff holding the Duke, which will gain you the 3 credits to pay for the Assassin that you are actually holding. Its finally your turn, you try to sneak those precious credits in unnoticed. As your fingertips just touch the prize, you think “YES! I’ve done it. No one will suspect a thing”. You start to slink the money towards you when you hear the challenge from across the table, “Like Hell you’re the Duke! I’ve got the Duke”. You can’t show weakness but your backs up against the wall, inside your screaming, “WHAT AM I GOING TO DO?? ?” You play it cool, time to show them what you’re made of. “Are you sure you want to make that call?”, a cold look of steel about your face, but really your legs are like jelly jumping castles. Your challenger hesitates, not wanting to lose their last card in a rash decision. He begins a retort but you cut it short, “Fine, just means one less of you I need to eliminate”. You reach for you card confidently, ready to flip it over, it’s do or die anyway, then you hear the withdrawal, “Alright. Take the money…this time”. You think to yourself, “Yes! A life-line. Now all I have to do is…”, the person next to you chucks 7 credits your way, “I’m couping you. You’re dead”. Your head drops between your chest and the table erupts into laughter. This is the sort of entertainment you just can’t put a price on. ‘Coup’ is an absolutely awesome game. Get it or you’ll get left behind. This entry was posted in Uncategorized and tagged bluffing, Board games, card games, Coup, Games, Kickstarter, lying, Poker, Resistance by wediealot. Bookmark the permalink. Great review, well done! I really like that Coup plays max 6 people as Resistance & Avalon is much better at 7+. The dynamic of Coup looks great for 6 players and below. I’ll keep my eye out for it. It also plays great with 2 players. Its quicker but its small enough to have in your bag for any occasion. Pub, coffee break, skyving at work in the toilets….ANY occasion. Heh! I ended up getting a copy & ran it tonight for one of my groups – thanks for the endorsement! Its a cool little game. You could spend a whole game night with Coup & Love Letter and have a fantastic time. Both are hilarious quick fire blasts of gaming goodness. This is a brilliant review of Coup–I rarely laugh while reading reviews, but you captured the anxiety perfectly! I played my first game of Coup on Friday and really enjoyed it, especially since all players are involved all the time. There’s no downtime at all. 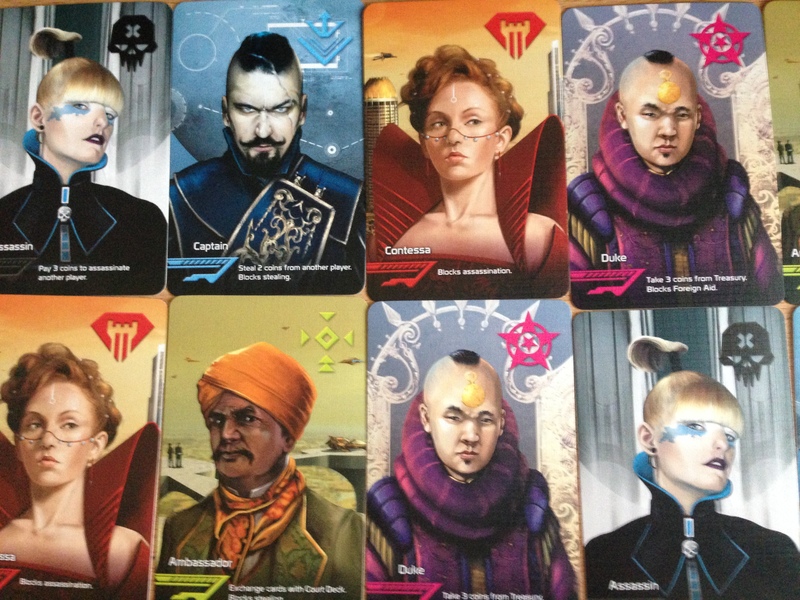 And I heard somewhere that you can combine copies of Coup for larger group games…not sure if that’s true. Thanks a lot Jamey. Glad you like it. The one thing I forgot to mention is how addictive the game is as well. We played so many rounds in a row last night it was ridiculous. That’s awesome. It plays incredibly fast, which I’m sure helps facilitate the multiple plays.